German prosecutors are investigating former VW CEO Martin Winterkorn and other company officials as part of a wider probe into market manipulation. FRANKFURT -- A Volkswagen manager told the then CEO and other managers that the carmaker's diesel-emissions violations could cost up to $18.5 billion, almost a month before investors were informed, German newspaper Bild am Sonntag reported. Investors were told about VW's systematic emissions test cheating using illegal software on Sept. 18, 2015, when the EPA informed markets. The Sunday newspaper Bild am Sonntag reported that Oliver Schmidt, a VW executive who was arrested in Miami in January this year, told the then-CEO Martin Winterkorn about possible financial implications at an Aug. 25, 2015 presentation. German securities law requires firms publish any market sensitive news in a timely fashion. A probe by German prosecutors includes investigating whether VW disclosed details promptly. The newspaper said Schmidt informed Winterkorn about the maximum possible penalty at the meeting that was also attended by Heinz-Jakob Neusser, VW's development chief at the time, and Herbert Diess, who still works as VW's brand chief. Bild am Sonntag cited U.S. investigation documents. A VW spokesman said the company would not comment on the report because of ongoing legal and regulatory investigations. It has previously said it did not violate disclosure rules. The VW spokesman also said Diess had no comment. 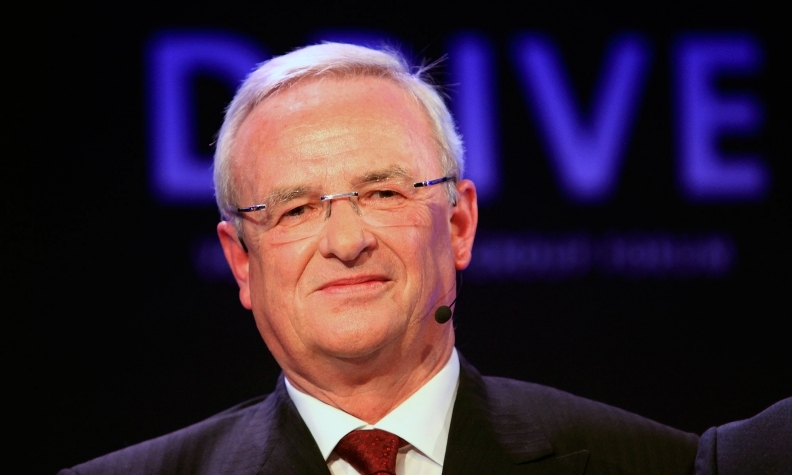 Lawyers for Winterkorn, who stepped down as VW CEO in September 2015, could not immediately be reached for comment. Annette Voges, the lawyer for Neusser, who also left his position in September 2015, declined to comment on behalf of her client saying she had not seen the statements by Schmidt. A lawyer for Schmidt declined to comment. VW admitted using a defeat device, the name used to describe software to deceive regulators about the real extent of diesel pollution, to the EPA and California's Air Resources Board on Sept. 3, 2015, according to VW's annual report for 2016. In the annual report, VW said its management did not make details of the scandal public before Sept. 18, 2015, because board members considered costs would be "controllable overall with a view to the business activities of Volkswagen Group." German prosecutors are investigating Diess, Winterkorn and VW's current chairman Hans Dieter Poetsch, as part of a wider probe into market manipulation. The executives have denied wrongdoing. German prosecutors conducting the investigation into market manipulation declined to comment on Sunday. Bild am Sonntag also reported that Winterkorn and Diess were informed that VW had used a defeat device at a meeting on July 27, 2015. Diess had joined VW just weeks earlier.